Students Tiana Dorley and Wesley Cox, Associate Professor of Africana Studies Serie McDougal and students Hanna Wodaje and Dmitra Lucas gather in the new Black Unity Center in Village C.
After several years of discussion and much planning, San Francisco State University’s first Black Unity Center is open for business. 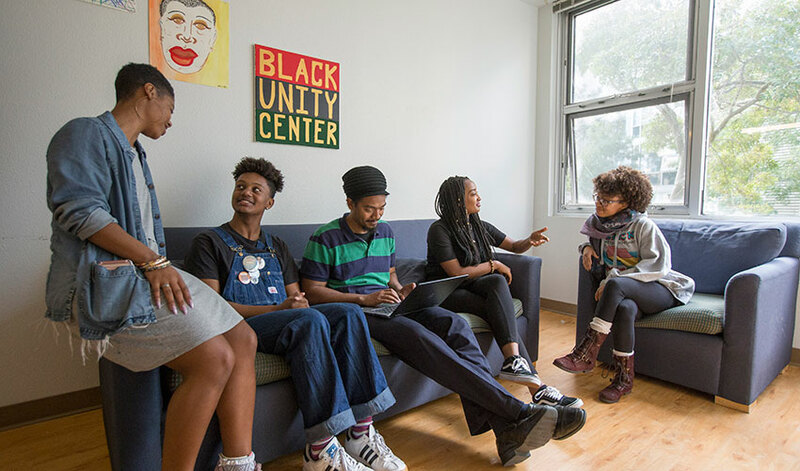 Part of the University’s new Division of Equity and Community Inclusion, the Center was created to provide a common space for SF State’s students of African descent to connect with one another between classes, to obtain tutoring and counseling and to organize and attend cultural programs. The Center opened for the fall semester and is housed in a former dormitory suite on the first floor of Village C, with two offices, a kitchen and a common middle area that includes couches and artwork created by student Wesley Cox that’s just beginning to fill out the walls. A major factor in the creation of the Center was the University’s goal of closing the educational equity gap in support of California State University’s Graduation Initiative 2025, which seeks to raise retention and graduation rates, strengthen student learning and improve the student experience at all levels. “A lot of studies have shown that if you don’t have the right advisers, and you don’t have faculty or role models in your university that represent you or understand your struggles, you’re less likely to stay within your major or your university,” said Ghila Andemeskel, a recent SF State graduate who was a leader in the Black Student Union (BSU). Students had been pushing for the Center for several years, and the idea came out of monthly meetings with President Les Wong, Andemeskel said. It was one of 10 issues identified through discussions exploring how to improve the lives of Black students at SF State. “We wanted to build something that will be long lasting. That way, when current BSU students graduate, the work will continue,” Andemeskel said. McDougal said he’ll spend much of the fall semester hiring a program assistant and four student workers to help build a social media presence and coordinate events. Speakers for this semester have already talked about “Afrifuturism” and will soon discuss “Homeplace Theory” and “Black Social Fathers.” A career workshop, a financial aid presentation and a writing seminar are also planned. “The College of Ethnic Studies has served a lot of these functions, but it serves so many functions and cannot be expected to take on everything, especially things that should be institutionalized on a broad level,” McDougal said.